The largest and oldest secular fraternal order in the world, Freemasonry crosses all religious boundaries to bring together men of all countries, sects, and opinion in peace and harmony to work towards the betterment of all mankind. A universal brotherhood, Freemasonry is dedicated to serving the divine through service to family, country, and humankind. It was 1870 when a group of Masons in lodges further afield saw the need for a Marmora Lodge. "Their efforts being favourably received, a formal request was sent to Grand Lodge for a dispensation to hold meetings. This request for dispensation was favourably received by Grand Lodge, and a dispensation was granted on July 14, 1870 by Grand Master, Alexander Allan Stevenson, approving George Edward Bull as Worshipful Master, David Thichett as Senior Warden and John Purdy as Junior Warden. Sealed and signed by Thos. B. Harris, Grand Secretary." Jan. 18, 1871, Thomas Warren was the first member to be initiated into Marmora Lodge No.222 and later in his Masonic journey became Worshipful Master in the years 1874-1875 and later in 1883. On June 26th, 1885, a communication was sent from the Grand Secretary's office, authorized by the Grand Master, inviting all Brethren and their Lodges to attend a meeting of Grand Lodge to be held at Marmora, for the purpose of laying the Corner Stone of their new Masonic Temple next to the Anglican Church. Minutes from a meeting of Sept. 7, 1886 we find that George Loucks is mentioned as the contractor of the building, and the minutes of Aug. 14, 1888 make mention of a mortgage, presumably taken out to cover the cost of the building. A communication was received from Grand Lodge, that draping the Lodge for three months in memory of Right Worshipful Brother Sir John A. MacDonald, the first Prime Minister of Canada, was required protocol. In the years to come, Marmora would be represented in the district by providing a District Deputy Grand Master. The first honoured Member was Right Worshipful Brother Thomas . E. Laycock, 1922-23. He was followed by R.W. Bro. C.H. Buskard, 1939-40. Succeeding them R.W. Bro. Ralph E. Neal filled the office in 1972-73 and R.W.Bro. Rodney Tompkins was the last Marmora brother to fill this high station in 1989-90. 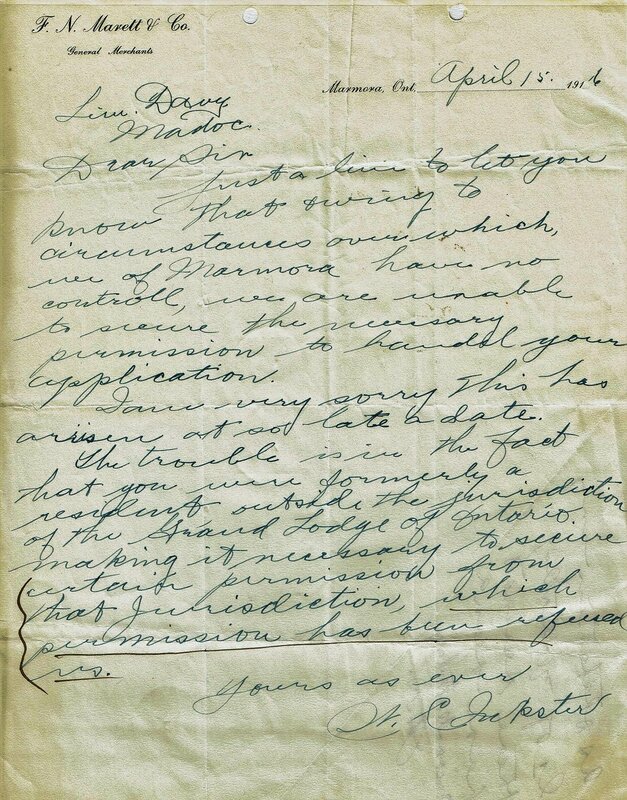 In 1916, Mr. Inkster denies an application by Mr. Davey due to residency requirements, but Mr. Davey seems to think it was all a misunderstanding! On occasion, the Masonic Hall was used as a school, including during the rebuilding of the public school (now the Legion Building) after the1915. Click here to read "One Hundred Years of Brotherhood"